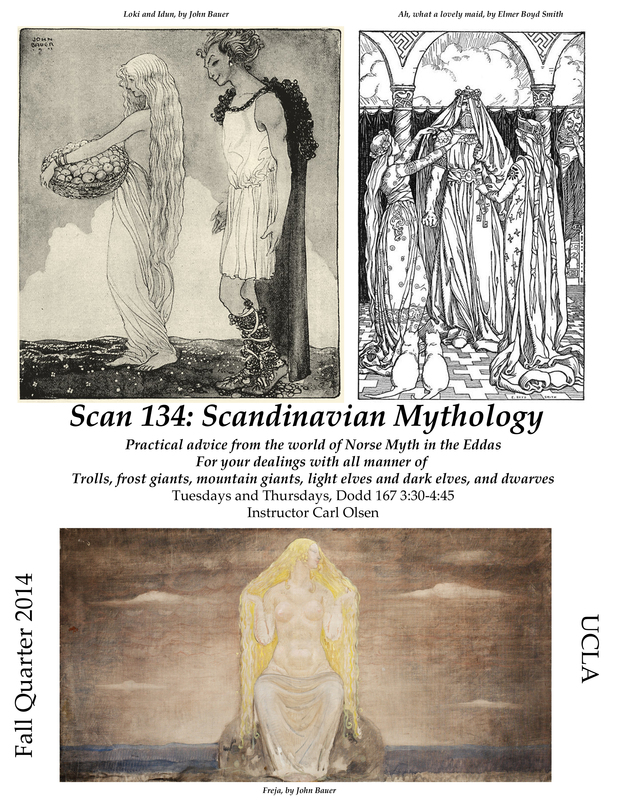 August | 2014 | Vikings, Books, etc. 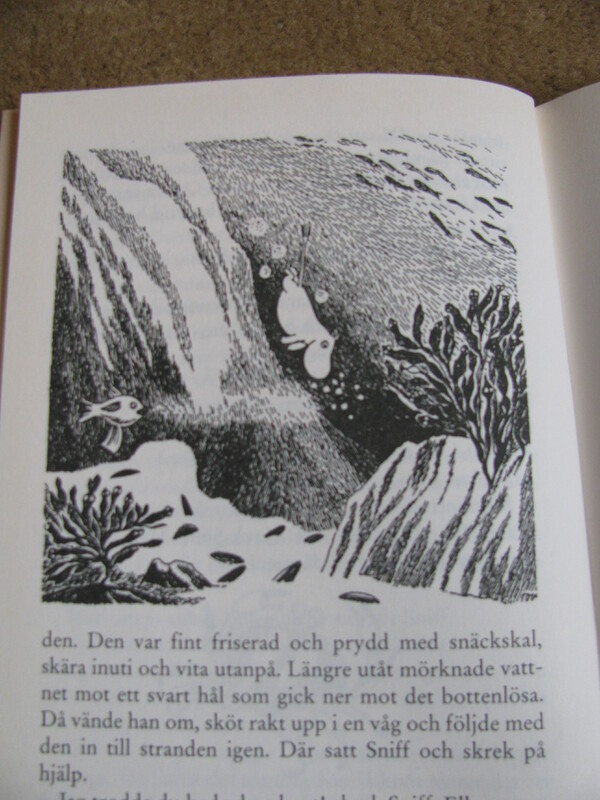 The great Finnish children’s writer (and illustrator/artist) Tove Jansson was born 100 years ago today! I first ran across her work when finishing up a final semester of undergrad in Lund, Sweden, and have been a fan ever since. As a “finlandssvensk” she wrote in Swedish, but of course her work is available in all sorts of crazy languages. I was hoping to do an illustration of my own, but I just don’t have time today–maybe later, I’ve been thinking of doing a moomin illustration for a long time. 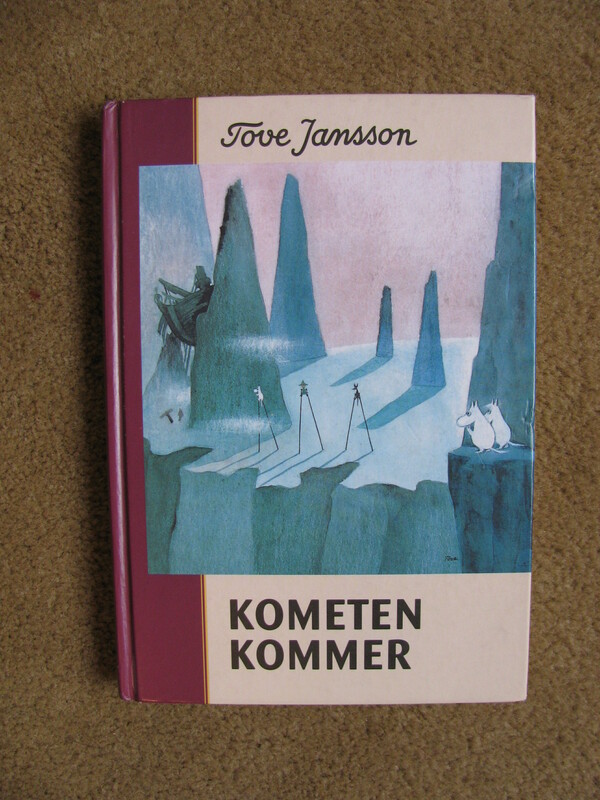 Meanwhile, here are images (see below) of almost all my Tove Jansson library–excluding, unfortunately, the first book I read by her (and still my favorite), Trollvinter (in English as Moominland Midwinter), which I stumbled through with my still shaky reading Swedish back in 2001, and which I enjoyed skimming through last winter in Minnesota (seeing as I finally actually had a midwinter to experience). Funny enough, while the Moomins hibernate through the winter (that being a key plot point for this story, in which poor old Moomin wakes up while everyone else is asleep), the fact that I read this book first (and during the Fall/early Winter in Scandinavia, though we got no snow in Lund) has forever associated the snow-man shaped moomins with winter for me. Ah well. 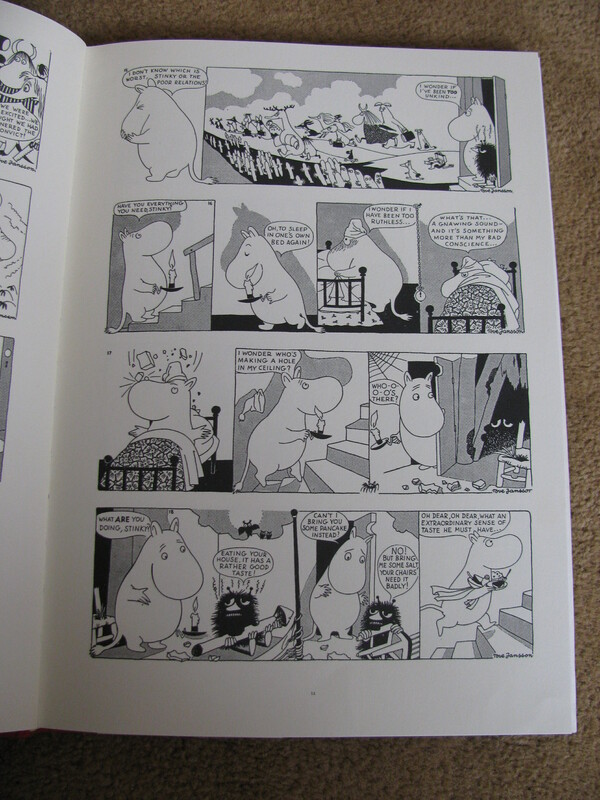 A couple years back I found out that Tove Jansson had done a comic strip based off of the Moomins as well, and for the London Evening News no less, so it is in English from the start. I can’t say how closely the strip and the children’s books are supposed to be aligned (haven’t read enough of either), but they certainly seem to share the same overall sensibility. 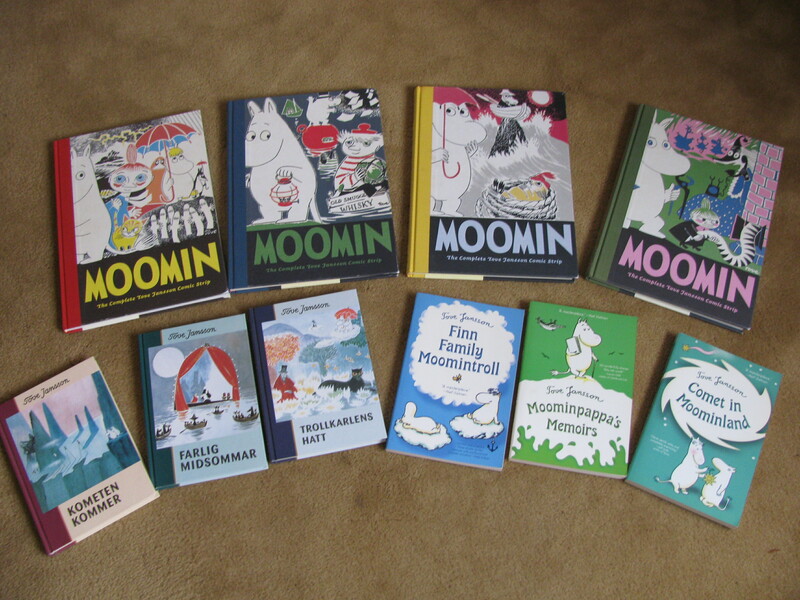 Meanwhile, here are all my Moomin books! 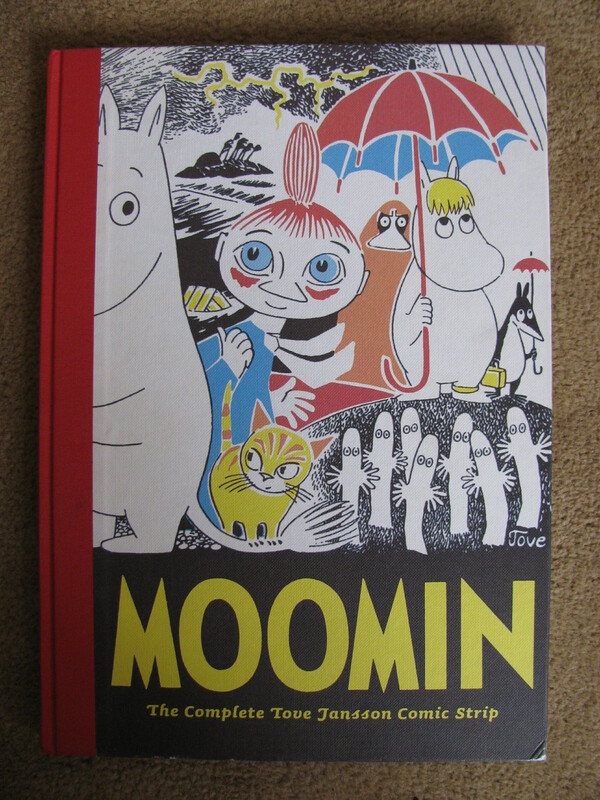 Minus Trollvinter and a picture book I picked up for my nieces when they were much much younger. Oh, and remember to check out the Moomin cafe next time you are in Japan!